Gifts from God come in all kinds of wrappings and I treasure the gift of my Grandson. 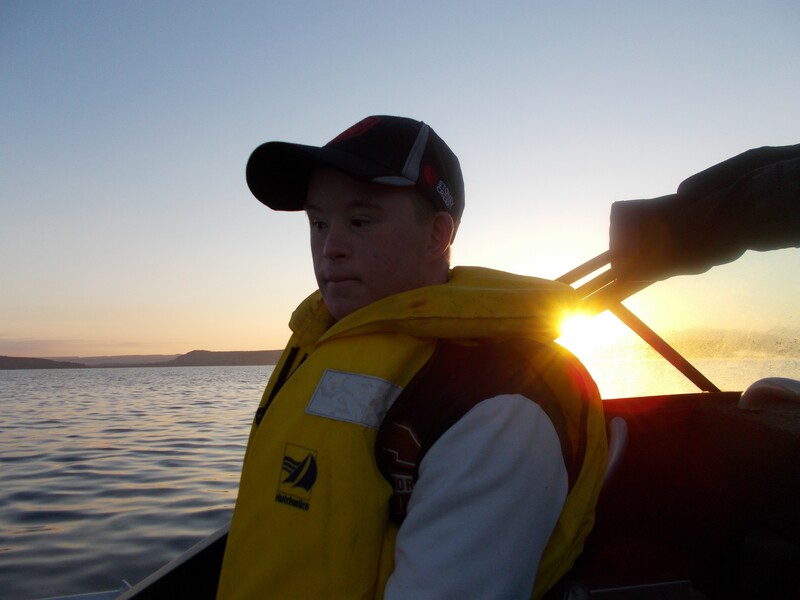 I am a Grandparent with fulltime care of my fifteen year old grandson James who has multiple disabilities, including Downs, Autism, Epilepsy, Hashimotos and sensory disabilities. He has had a recent diagnosis of Juvenile Arthritis. All issues apart from Downs have been diagnosed since he has been in my care. I love my boy, for many reasons. He has made me a much better person. He has taught me to be kinder and more understanding and above all I have learned patience. He has shown me a new world full of unconditional love and unending joy. I wish you could see my laughing boy. But it hasn’t always been that way. This child was a victim of relentless parental neglect until he was removed to my care in 2007. There was no ‘early intervention’, minimal medical contact and very occasional schooling. My wee man has a severe intellectual disability; I have had to accept that he has an IQ of 40 and an intellectual age of 6 years. He will never hold a salaried position; nor will he ever drive a car. BUT; he will never have a tax problem nor will he have a mortgage so, who has the disability? He has progressed from an 8 year old nonverbal lump who weighed 15kgs, who sat and rocked on the floor – into an active exuberant boy who loves to run and play. This boy has undergone a number of medical procedures and we have had some great results but it hasn’t finished. From thinking that it was normal to wear nappies, it has taken a huge effort but he is now toilet trained! He is very proud of his major achievement. His speech is progressing and he can (for the most part) make himself understood but I realize that he will never be fully articulate and will always need help. At mealtimes, he always sits at the table and uses cutlery when eating. He has developed his own taste in food but ice-cream is always there! He has his chores that he zealously guards. He has learned some manners, please – thank you, and asking politely but we are still working on it. My boy was absolutely terrified of water but after many hours at our local pool slowly, slowly I got him into the water, now swimming is his most favourite pastime. So much so Grandma had to visit Gumtree for a pool. 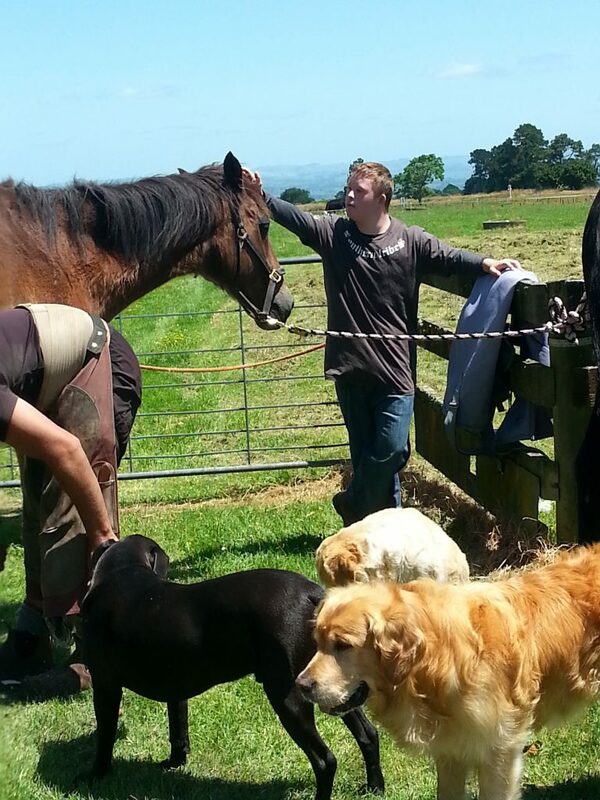 He has become a very sociable boy who loves having his friends visit, especially for a pool party and Grandma’s BBQ. He attends a special education school every day and loves it. He has developed a special relationship with his teaching staff. He just loves them and his school. Their dedication and love cannot be underestimated. School staffs have been the major strength in his improvement. Now my little man has grown, he is at High School. What a joy to see him grow, healthy and happy. So many people said it was doubtful but we did it. We survived together! I don’t feel that I have done anything special for my wee man but love him and I tell him that every hour of every day. He thrives on hugs and kisses and so do I, we love each other and I think that is the key. Without wanting to sound melodramatic, He is the reason I get up in the morning and I thank God for entrusting him to my care. Shirley is one of our members. She wanted to share her story to highlight how children with a disability can thrive when provided with support and love. In September 2016 Shirley was diagnosed with stage 4 Cancer. She is currently receiving Chemotherapy treatment. During this time the Active Foundation have been an incredible support providing respite care for James picking him up from school and dropping him home later in the week. Allowing Shirley to time to recover from her Chemo treatment. Today is World Tuberculosis (TB) Day, 2017 is the second year of the “Unite to End TB” campaign. The UN Sustainable Development Goals and the WHO End TB Strategy target is to end TB by 2030. 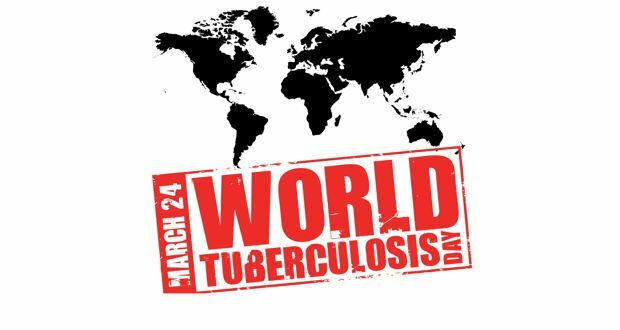 Click here to read more about World Tuberculosis Day and how you can support the “Unite to End TB” and “Leave No One Behind” campaigns. The following article, first published in Health Matters Magazine in 2016, written by Majok Wutchok, (a member of the Sudanese community in Perth) outlines how West Australian Tuberculosis Control Program could be improved from a consumer perspective. Tuberculosis (TB) is considered the second most deadly disease after HIV/AIDS in developing countries. Every year there is a mass movement of Australian’s travelling overseas on holiday and returning home. A major concern is there isn’t proper health promotion and public health education to protect consumers when they and their relatives return from overseas. Due to the lack of public health education they and their family may not be aware they are coming home infected with a tropical or communicable disease. I recommend the WA Health Department set up a consumer overseas travellers screening task force, to avoid a future catastrophic spread of disease across the state. There is also a need to engage with healthcare providers to empower those infected with Tuberculosis and other communicable diseases and to support and empower their community. Tuberculin Skin Test (TST), also known as Mantoux testing and BCG vaccinations to selected populations. Training and accreditation can be provided for relevant health professionals. Consultation: Specialist advice from medical and nursing staff is readily available, including preventative advice, health service education and access to information programs. Even in 1918 the thinking regarding Tuberculosis, was ‘Prevention is better than a cure’ (Cobbett, L 1918, British Journal of Tuberculosis, vol. 12, no. 1, pp. 16-19). According to the World Health Organisation (WHO 2014), prevention strategies involve encouraging and conducting research. It has been suggested that integrated intervention programs with consumers and their communities involved can be very beneficial. As opposed to vertical programs which are considered limited, integrated programs are considered far more effective for prevention. However, integrated programs need established communication and consistent health education together with consumers’ participation across all aspects. Regarding primary healthcare and consumers, the involvement of a population group from high-risk consumers is paramount. At the same time public health education and community health promotion are also considered important, and are associated with the continuous use of those preventive measures by the consumer’s communities. In short it is important sustainable prevention measures are taken to educate those at risk, to prevent them catching Tuberculosis and other communicable diseases while travelling, rather than simply screening and treating the disease when it has already been contracted. If you would like assistance partnering with consumers in health, the HCC Consumer & Community Engagement Team can help! HCC facilitates on-site workshops that assist health care staff to increase their understanding of effective partnering with consumers in the governance and operational structures of your organisation. Principles of consumer participation within the context of health service accreditation can also be a key component of this bespoke fee for service training. Training can be conducted specifically for board members, executive committee members, management and point of care delivery staff, or with a whole of organisation approach. We can provide new and existing consumer members with information on the elements of quality and why patient safety is a critical area of focus in health care. This fee for service training can be tailored to meet the needs of specific safety and quality committees. Please complete the form here to register your interest in HCC’s workshops. Be optimistic, a second opinion can save your life! In 1993, I started having trouble seeing properly through my right eye. It was as if I was looking at the world through a spider’s web. An ophthalmologist diagnosed a condition which he called “collagen stringing”. He explained that all the ‘lines’ interfering with my sight were in fact strings of collagen cells which had formed inside my eye. He told me the condition couldn’t be treated and I would eventually go blind in that eye. A year or two later, other symptoms started to appear. I began to forget things. My family, friends and staff picked up on changes in my personality. Like most people with an emerging mental health problem I was not aware that something was wrong and typically I refused to listen and seek medical help. The eye problem hadn’t got any worse and I had accepted it as normal. My family and I did not connect it with these new symptoms that were causing serious problems in my private and professional life. In December 1999, an optician advised me to seek a second opinion ( another ophthalmic examination) and referred me to arguably the leading eye clinic in Perth. This time, the very senior ophthalmologist (who denied any knowledge of a condition called “collagen stringing”) took one look in my eye and sent me off for a CT scan. This happened on a Friday afternoon at 3.30pm and by 6.00pm that same day, I was in the consulting rooms of a neurosurgeon to discuss how to deal with a primary but fortunately benign brain tumour called a meningioma the CT scan had revealed behind my right eye. The meningioma was wrapped around my right optic nerve which explained why I had been having vision issues in that eye for so long. The meningioma was as large as a squash ball and had pushed the right frontal lobe of my brain out of alignment inside my skull. As a result, I had been and was still living with a mental health condition called Frontal Lobe Dysfunction – the sinister source of all my personality issues and some very costly and unexplainable decisions I had made in my business which was by now heading south at an alarming rate. The neurosurgeon told me I had two choices – I could leave it in situ or have it taken out. He then told me that it would kill me within two years if I left it in – it was still life threatening despite being non-cancerous and not metastatic. What to do? Perform a craniotomy as quickly as possible. From then on, things moved quickly. I was introduced to MRI machines and was admitted to hospital early the following week. Subsequent blood tests indicated I experienced a cardiac event during the craniotomy which took nine hours or so to perform so after a short spell in ICU, I was transferred to the CCU where I remained for two days. Presumably because there were no further symptoms of a heart problem. I was then transferred back to a surgical ward where I remained until discharge a week or so later. Among the post-discharge medications prescribed for me was one called Dexamethasone. It is a corticosteroid with potentially major side effects including elevated aggression, agitation, anxiety, irritability and pronounced mood swings. I experienced all of these to such an extent that I became an extremely unpleasant person to be around – so much so that my relationships with members of my family were strained to their limits. I did not know then whether my behaviour was due to the medication or the effects of head entry surgery which I believe can have much the same effect on behaviour and personality etc. as a serious acquired head injury. Either way, life was not good – so much so, I tracked down an organisation known then as the Head Injury Society and left a request on their voicemail for an urgent call back. Three weeks later, I got that call only to be told that the first appointment they could give me was in three months’ time! There were some other subsequent issues relating to life insurance policies and our business which caused even more heart-ache than the dexamethasone but these are not relevant to a patient’s story from a health service provider’s perspective other than to say that serious injury or illness impacts on many more aspects of one’s quality of life than merely those which are typically considered in a health service care plan. Hindsight is a wonderful thing but my family’s and my experience of the continuum of care would have been better if the following could have occurred before and/or during the events in question. A campaign to educate the community about how to recognise the early symptoms of mental health problems for individuals and their families could have helped me to react more appropriately to the very genuine and now appreciated attempts by my family to convince me that I needed medical advice. Such a campaign these days could be incredibly effective given the knowledge distribution capability and reach of the internet. Had I sought a second opinion about a diagnosis of “collagen stringing”, the real cause of my sight impediment may have been discovered years earlier and the size and life impacts of the meningioma reduced accordingly. In those days, however, the thought that a clinician could be wrong just did not enter people’s minds and most people, including me, just went along with what they were told. Here again, a public education programme conducted by an appropriately trusted organisation would enhance public understanding of a consumer’s right to question a medical opinion and the wisdom of not placing blind trust in a health practitioner. At the time, bearing in mind that I was recovering from major surgery, no effort was made by the hospital to make sure that I fully understood why I was being sent to the CCU. Equally, no further tests were done so I was kept totally in the dark about my symptomology and progress if any. Likewise, I was given no opportunity to start coming to grips with the prospect of a future with a potentially serious heart condition. Three days after leaving the hospital, I went to see the latest James Bond film. Imagine my wife’s and my horror when, another two days later, the nurse removing the sutures from my head told us that I should not have gone as loud noises and bright lights could have caused me to have a fit thanks to the side effects of my head entry surgery and the dexamethasone. No such advice was given during my discharge from the hospital – all we did learn was that I was not allowed to drive a car for the following three months. My patient experience has a good ending. The removal of the meningioma restored the sight in my right eye immediately. A subsequent angiogram and stress ECG confirmed that I did not have a heart problem. 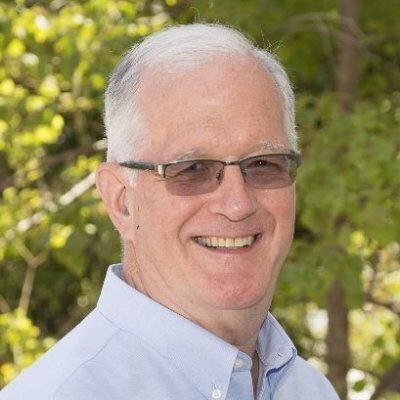 My personal and business lives are now back on track and I have learned a lot – and met some fabulous people – by investing my time in the promotion of consumer involvement in how the health system should look as it faces the challenges of the future – particularly from a patient’s perspective! Powerful Change Can Happen When There Is A Shared Vision Of What Works. 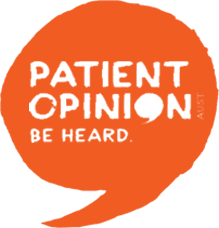 Join The Health Consumers’ Council And The Australasian College Of Health Service Management As We Start A New Conversation About Patient Experience. Expertise is found at both ends of the discussion between patient and healthcare provider. It is in administration, in hospitals and community settings. It is found in homes, with our carers and the community at large. 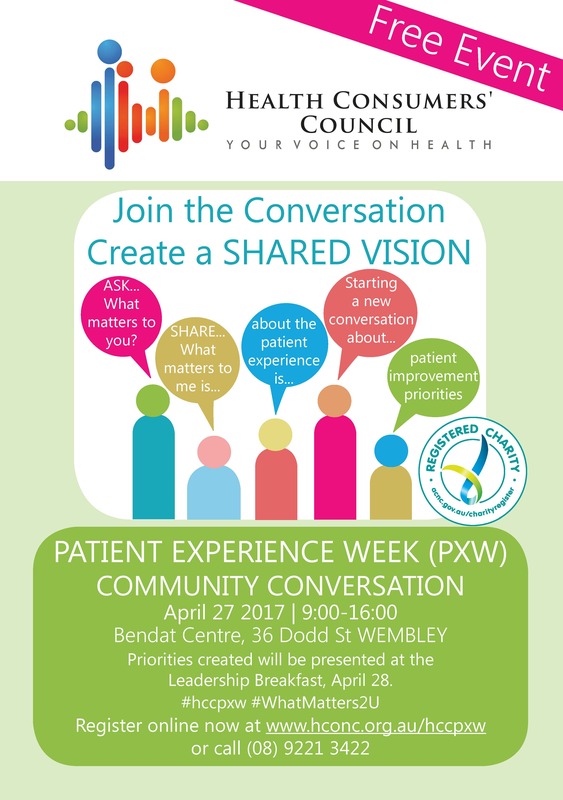 So join the conversation to create a shared vision, SHARE… What matters to me about the patient experience is… and ASK… What matters to you about the patient experience? CommunityWest in partnership with COTA Australia has been undertaking a national project, trialling co-production in the aged care sector. The Step Forward – Together project has ten pilot sites using co-production in their organisations over the last eight months resulting in great success as a method for service improvement and innovation. The consumers involved in the pilot site projects have also benefited from being involved and have reported increased confidence, improved relationships with staff, increased sense of self-worth and value, a renewed sense of purpose in life, and new skills and knowledge learnt. Brenda Bryant is an avid writer and poet and has been writing a blog of her time during the Step Forward – Together project. She was delighted to be asked to take a peek behind the scenes and contribute to the renewal taking place in aged care nationwide. Brenda is 85 years old and has accessed home care services provided by Novacare Community Services since having a stroke three years ago. By being involved in the Step Forward – Together project, Brenda feels even more appreciative of the effort made by Novacare to genuinely engage with the older people in her community. Brenda believes there has never been a better time to be old and has written this poem about her time with the project. And compare the ‘what is’ to ‘what was’. We must bring every mind into play. And feel glad ‘cos we’re having our say. I encourage you all to take part! Use your brain for its bright and it’s smart. Cause something unusual to start! The ten pilot site projects complete 31 May and CommunityWest will be disseminating the learnings of the project over the coming months, including a documentary and ‘how to’ guide and toolkit on co-producing aged care services. For more information contact Kelly Gray, CommunityWest Consultant, (08) 9309 8180. If you are obese your chances of achieving normal weight without surgery are slim to put it mildly. If you are male, you have a chance of one in 210. Women fare a little better; their chances are one in 124. These depressing statistics come from a ten-year study of 77,000 obese men and 100,00 obese women in the UK. To compound this picture at least half of those who managed to lose substantial amounts of weight put it back on within five years. No wonder the diet and gym industry is booming. Dr Simon Rosenbaum, national director of Exercise and Sports Science Australia, writing in The Conversation says weight loss important but fitness, not fatness is a better focus. He says many people who start an exercise program to lose weight are setting themselves up to fail because exercise in the absence of dietary modification is not all that effective for weight loss. An online survey carried out by CSIRO says Australians are their own worst enemies when it comes to eating better and controlling their weight. The survey, which looked at the weight management habits of more than 2300 Australians, found 69 per cent of respondents identified themselves as the main barrier to achieving their weight loss goals. CSIRO’s Research Director for Nutrition and Health, Professor Manny Noakes said it was critical that those looking to lose weight seek support. The good news for seniors is that being overweight (but not obese) is not a health hazard. 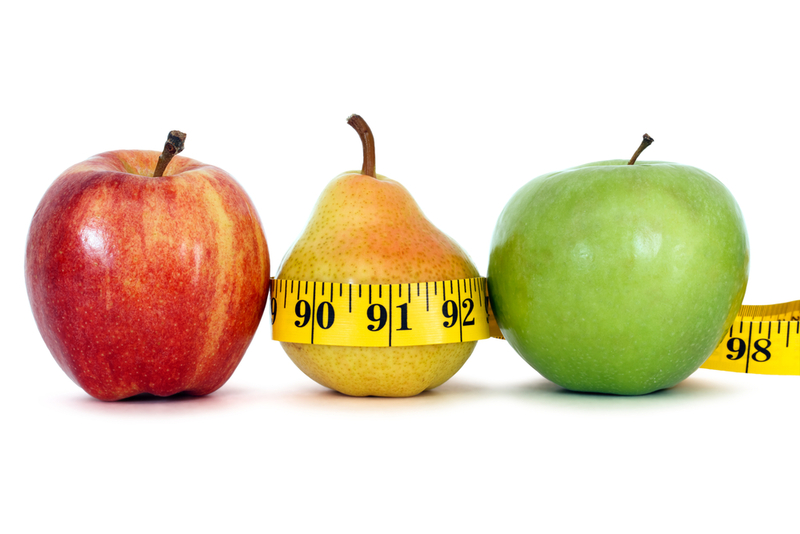 Ms Ngaire Hobbins – a dietician who specialises in the care of older Australians – warns that a healthy weight once you are over 65 is not necessarily the same as applies for younger adults. She says a Body Mass Index (BMI) between 23 and 28 is probably ideal for older adults. Being thin in older age is associated with a higher likelihood of dementia, of having a fall, of general poor health and even death. Those who are a bit heavier fare best. Ms Hobbins’ conclusions are supported by researchers at the University of Western Australia. Dr Rosenbaum says exercise is important, but for other reasons. It helps protect against developing chronic diseases, such as type 2 diabetes, even for people who are obese. A recent state-wide survey shows that many people don’t know that 30 – 40% of cancer cases in WA are preventable. With almost 12, 000 Western Australians diagnosed with cancer every year, this is both shocking and heartbreaking. This report summarises responses to an online public consultation conducted last year on the seven cancers which have the greatest impact on the WA community and greatest opportunity for prevention: bowel, breast, cervical, lung, melanoma, prostate and oesophageal/stomach cancer. The report has revealed that a third of participants were unaware that much could be done to prevent cancer. In particular, many people were not aware of the dietary risk factors for bowel cancer and that cervical cancer is almost entirely preventable. A poor understanding of the preventability of cancer is not necessarily surprising as historically, much of the discussion about cancer in the community has focused on treatment, sometimes to the detriment of prevention messages. However, it does highlight the potential for reducing the pain, anguish and cost associated with treating cancer. The value of this new report is that, in seeking out community views on priorities and preferences for cancer control it has identified some clear areas for increased action in the immediate future, including: Increasing the number of Western Australians participating in the National Bowel Cancer Screening Program; Strengthening health promotion messages around recommended red meat intake; reducing processed meat consumption; reducing alcohol consumption; and reducing salt intake, as well as links between obesity and cancer risk; Working to raise the profile of cancer prevention and early detection; and Building on gains made in tackling harm caused by smoking, exposure to ultra violet radiation and asbestos, as well as exploring new and innovative programs to reach vulnerable groups and address emerging issues. 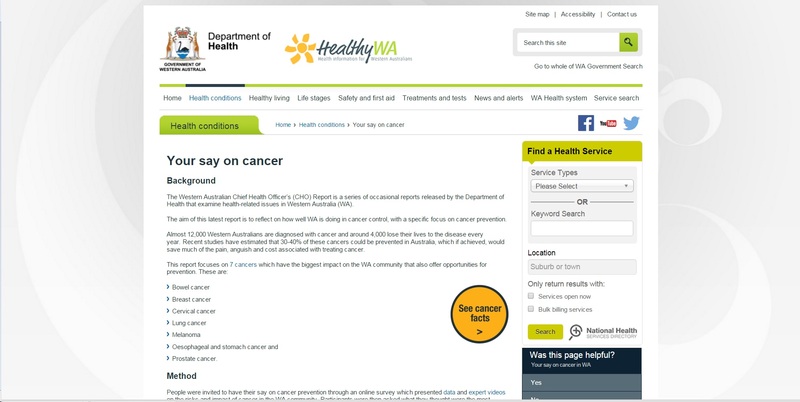 This is the first time the Chief Health Officer of WA has asked the community for feedback in a report and the first time (to my knowledge) an online forum has been used to gather community opinion on cancer prevention in WA. As a co-author on the report it was a privilege to bear witness to the frank, open and creative ideas for cancer prevention from our consultation participants. We are very grateful for their input and the time they devoted to answering our questions. The report was prepared in collaboration with a number of agencies including the Health Consumers’ Council WA, Cancer Council WA, Public Health Advocacy Institute of WA, Curtin University and WA Clinical Oncology Group. As a project team we also had a lot of fun planning and putting together a consumer website with a range of supporting material including a summary of the report findings, some innovative infographics of cancer data, and expert videos.